Geology.com advise, "Native gold is an element and a mineral. It is highly prized by people because of its attractive color, resistance to tarnish, and its many special properties - some of which are unique to gold. Its rarity, usefulness, and desirability make it command a high price. Gold occurs in hydrothermal veins deposited by ascending solutions, as disseminated particles through some sulfide deposits, and in placer deposits." Uses Numerous uses in jewelry; coinage; bullion; currency backing; an electrical conductor used in computers, circuits, appliances, cell phones, etc. ; dental work; gilding. 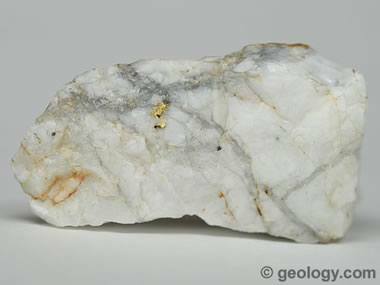 Vein gold: White "vein quartz" with gold. This specimen is approximately one inch (2.5 centimeters) across.